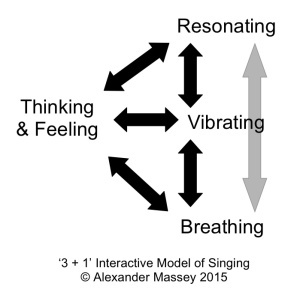 The ‘3 + 1’ Map of Singing- Pt 1 describes how Breathing management, Vibrating source (vocal folds), the Resonating system, and Inner Life (thinking and feeling) all play a role in singing. It is not uncommon for uninitiated singers to think (mistakenly) that singing is somehow a linear process. In a linear model of singing, breath is described as being sent upwards from the lungs, meeting and passing through the vocal folds to create a raw sound signal, with the sound signal then passing into the mouth where it is modified by resonators and articulators, continuing on its one-directional journey out of the mouth. 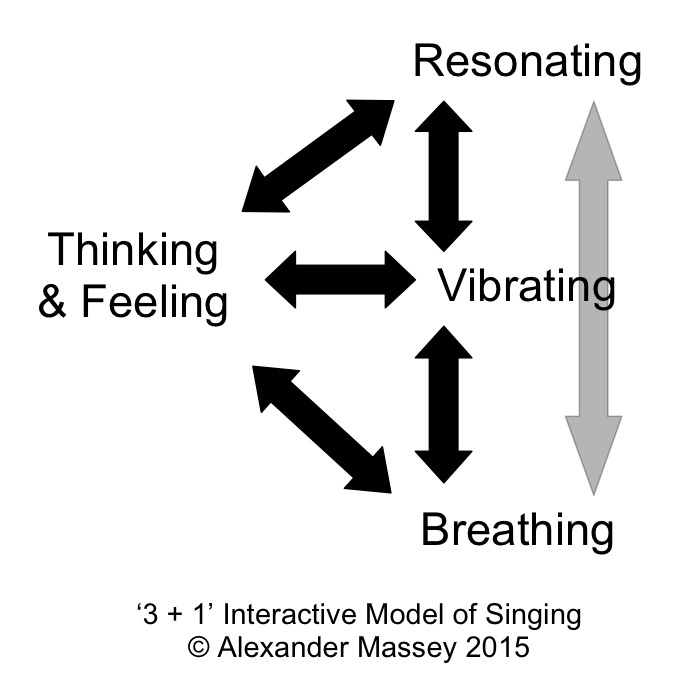 However, this model is too simplistic, and does not reflect the reality of the physics involved in singing. It is important for singers to realise that singing is about interaction between different systems. This article gives a brief outline of an interactive model of singing, in which the systems of breathing, vibrating and resonating all affect each other – this has important implications for how vocal technique is learned. The article Breathing for singers is different from normal breathing (Breathing 1) describes how singers must use their rib muscles and abdominal muscles to control the inward and outward flow of air. It is possible to retain the air in the lungs simply by not letting the ribs close or the abdominal muscles squeeze. However, some people ‘hold’ the air in by shutting the vocal folds together (closing the glottis). There are times when we need to do this, for example, when lifting, pushing or pulling something heavy, as it helps us brace our upper body. However, closing the glottis just before making vocal sound is counter-productive. While this may give us a sense of ‘control’ and enable us to produce a hard, emphatic ‘attack’ on a the beginning of a word or phrase, such constant gripping and explosive force on the vocal folds limits their flexibility. Using hard ‘glottal attacks’ (glottal stops) in singing therefore limits the variety of sound signals we could create with the folds (and therefore sound colour / timbre and range of volume), and also limits pitch range and sound duration. Repeated, forceful glottal attacks in singing can lead to the severe problem of vocal nodules (see Wikipedia article). So it is possible to use the vocal folds as an important valve for regulating air flow from the lungs into the mouth. However, if we treat the vocal folds in this way, we interfere with the singer’s purpose, which is to use the folds primarily for generating the raw sound signal and varying pitch. So, to expand an earlier point, singers must use primarily their rib muscles and abdominal muscles – not their vocal folds – to control the outward flow of air. This last point must be qualified, though. Because it is the interaction between breath flow and the action of the vocal folds that creates the raw sound signal. Varying the tension of the vocal folds and how closely they are brought together means that we vary the nature of what the upward airflow meets and has to pass through. Varying the airflow means that the vocal folds (for a given level of tension and closeness) will vary in how they move, both in speed and amplitude (the distance up and down). The sub-glottic pressure (the pressure below the vocal folds) is governed by both how air is delivered up onto the folds, and how the muscles operating the vocal folds are used. The laryngeal strategy (see forthcoming blog article Laryngeal strategy – demystifying chest register and head register) adopted by the singer will also influence the nature of the sound signal generated at the level of the vocal folds. So the Breathing system acts upwards on the Vibrating source, and the Vibrating source acts downwards on the Breathing system. The Vibrating source interacts with airflow (from the Breathing system) to generate sound waves (sound signal) made up of a range of frequencies. Each frequency has its own sound level (energy output). Without the Resonating system we would hear this signal – this collection of frequencies – as simply a buzz, perceiving this buzz has having both a single pitch (hearing it as a note), and a timbre (tonal quality or ‘colour’) – a bit like a giant bumble bee. The interaction between the Breathing system and Vibrating source designs the pressure wave that the Resonating system receives as input. The Resonating system can influence whatever input it receives from the vocal folds. It is the Resonating system that converts this buzz into what we recognise (as listeners) as vocal sound. By altering the shape of the Resonating system (height of larynx, opening of the phayrnx, jaw opening, soft palate, tongue, lips) we can choose which frequencies we boost, and which we suppress. This alters the sound wave so much that the a vowel can be shaded or brightened or coloured to conform to a particular regional accent, or it can be modified so much that it becomes a different vowel altogether. Moreover, parts of the Resonating system can be moved in order to enunciate different constants. All these adjustments of the Resonating system act upon and modify the sound waves arriving from the vocal folds, influence what the listener hears. The interventions with the Resonating system therefore affect the pressure system above the vocal folds (supra-glottic pressure). This means that, while the Breathing system acts upwards on the vocal folds, the Resonating system partially acts downwards, affecting what happens physically at the level of the vocal folds (Vibrating source) below it. If both the Breathing system and Resonating system are well managed, the sound waves in the mouth and throat – and therefore the pressures bearing downwards on the vocal folds – are such that the folds will perform much more easily and flexibly, and the singer will feel far less workload in the laryngeal area. The singer’s Vibrating source is a lot ‘happier’ when the Resonating and Breathing systems are being used well. Given that the Vibrating source affects what input the Resonating system receives, and the Breathing system acts on the Vibrating source, this means that the Breathing system indirectly affects what the Resonating system has to work with. But, just as importantly, given that the Resonating system affects the Vibrating source, and the Vibrating source affects the Breathing system, this means that the Resonating system indirectly affects the Breathing system. The article Voice as a holistic system: the Voice Pentagon looked at the relationship between vocal sound, the body, emotions, thoughts, and even our fundamental worldview. Common sense tells us that our emotions are both experienced physically, and show up in our faces and how we hold ourselves, breathe and move. And we know that our emotions are revealed in our tone of voice. Focused thoughts enable us to train and run our muscles in precisely coordinated movements, which eventually means that we can develop the gross and fine motor control necessary for singing. Thinking and feeling affect the physical self. Conversely, a change in breathing patterns, posture and muscle movement or tension provide feedback and sensory data to the brain, and can trigger memory or patterns of thought or emotion, adjustments to levels of adrenaline or testosterone, and so on. What happens in our body can affect both what we think and feel. The mind is sending data to and receiving data from the singing body. To sing well, we need a comprehensive model of voice in which we understand what each part does, and how the parts relate to each other. Resonating problems could be a symptom of something else – If a singer or listener thinks the sound is not as it should be, it could be that the singer is not managing the Resonating system well. But the singer should not put all their attention on the Resonating system, as the root cause may be more to do with the Vibrating or Breathing systems. Vibrating problems could be a symptom of something else – If the singer feels uncomfortable in the throat / neck area (something to do with the Vibrating source), it might be because of direct mis-management of that area. Or the over-exertion in throat and neck may be compensation because the Resonating or Breathing systems are being mis-managed. Breathing problems could be a symptom of something else – If the singer is struggling with breathing, feeling they don’t have enough air supply for a phrase, or not enough ‘support’1 for a note, or can’t breathe quickly and efficiently between phrases, it might be because of mis-management of breathing. But the problem may be the indirect result of mis-management of Vibrating or Resonating. Function or dysfunction in thinking / feeling could arise from something physical – such as physical inefficiency, illness, hyper- or hypo-ventilation, and so on. When a singer says to their teacher, “I’ve just got a quick question”, the likelihood is that a good diagnostician will not rush to an answer. A good answer to a ‘quick question’ has to take account of this interactive model of singing, of all the possible, relevant variables, and what the singer currently knows about singing.